This is a beautiful golf course Dogwood model, ready for entertaining! Amazing wide open views from kitchen, master and great room of the 14th green. Two bedroom, with bonus room. Spacious master bedroom, bath, and walk in closet. Plenty of room for entertaining and gourmet meals in the kitchen with all appliances and center island. Walk outside to the flagstone patio and NEW built in BBQ, relax by the fountain, and the gas fireplace! If you need a bonus, the garage has built in cabinets, is extended, so 3 car and a golf cart can fit...plenty of room for tinkering and projects plus expanded laundry with office set up. 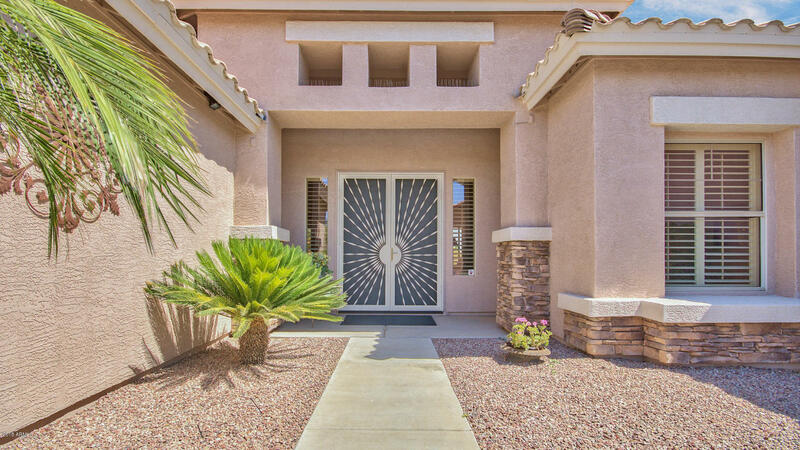 All doors have security doors, including the garage, to enjoy the AZ breezes when you can. The home has been loved and cared for, and will not disappoint!